Then I heard a loud voice in heaven, saying, “Now the salvation, and the power, and the kingdom of our God and the authority of His Christ have come, for the accuser of our brethren has been thrown down, he who accuses them before our God day and night. And they overcame him because of the blood of the Lamb and because of the word of their testimony, and they did not love their life even when faced with death” (Revelation 12:10-11). I don’t know if I can hear that phrase directed at me without feeling old, though I tend to say it myself out of respect to those working in businesses I frequent—whether the employees are older than me or thirty years younger. But now, with many of the new teachers coming to my school fresh out of college, I am definitely one of the “oldies,” and when they say, “Yes, ma’am,” I’m pretty sure it is because of the age factor…. But I’m thinking I may just have to start saying “Yes, ma’am” or “Yes, sir” right back to them. These young people already have gained my respect. “Newbies” they may be, but these youngsters began to inspire me a couple of weeks ago when they shared their testimonies in front of our school family at a midsummer meeting. As they shared how they met Jesus and how that meeting transformed their lives, I saw something in them that made me want to be in their classrooms. I also saw how powerful a personal testimony can be and, though I share bits and pieces of my life in prose, I thought it might be time to share my own story. Revelation 12:11 says that Satan is defeated not only by the blood of the Lamb (Jesus) but by the word of our testimony. After hearing these students, I dug out my old summer project notebook from my adventures with Campus Crusade for Christ way back in 1987. At that time, I was required to craft a pithy testimony, memorize it, and then share it with perfect strangers along the boardwalk and neighborhoods in Wildwood, N.J.
At the age of 8, I had trusted Christ and His death on the cross to pay the penalty for my sins, but this decision had not really changed my life. In my teenage years, I was a good person, actively conscious of high standards and morals. I attended church and was even involved in youth group leadership. With these credentials speaking for my “goodness,” I thought I deserved the desires of my heart—and, as a dreamy-eyed 17-year-old, my heart desire was to have a boyfriend. So the summer after I graduated from high school, I challenged God to give me that special boyfriend or tell me why I didn’t deserve one. Soon after I made this challenge to God, I chose my man. He was taller than me, weighed more than me, and was, of course, a Christian guy, one who would be good like me and good to me. Those were the three qualities I had looked for most in a guy. So I told God about him and began to think strategically. At this point of my life, I had a good friend named Mario, and when he heard I had the hots for this guy, he told me, “Sara, he has his eyes so fixed on God that the only way he’ll see you is if you’re fixed on God, too.” Mario knew about me what I didn’t know myself—my eyes were not fixed on God. But now I knew my strategy—I would became a “Godly woman”—and this is what I set out to be. Well, it blew me away. I had been attending church for years, and I certainly didn’t think God was exciting! A few days after our time at the beach, I went to an evening service at church. That night, when the speaker closed his talk, almost everyone in the church went to the front, obviously greatly moved by the sermon. I just sat there, in my pew, watching and wondering what this guy had said to make the people react this way. There I sat, the “Godly woman,” a leader in the church. I felt stupid—really confused and as if I were missing something. I began to pray, asking God why I alone sat in the pew. That night it became clear to me—I had been trying so hard to portray myself as a “Godly woman” that I had forgotten God. In fact, I was the center of my life—my interests, my desire for a boyfriend, even my “goodness.” As I had mentioned, even though I had received Christ as my Savior to pay the death penalty for my sins, I realized I was still in control of my life. I merely had been serving myself and adding God only when I needed Him. That night I realized God wanted more—He wanted to be first in my life. He wanted to be Lord—director of my personal interests. That date was July 10, 1983. I’ll never forget it. From that time forward, I was excited about God—just like Glenn and his friends. I wanted to talk with God and learn more about Him. In fact, I was so excited about God that I didn’t even care if I had a boyfriend anymore. God began that day to make me into the Godly person I had pretended to be for so long. Besides that, Mario was right. Once I fixed my eyes on God, I got my man, too. Ironically, the summer that I began sharing that testimony was the summer that I met the man I would marry—not Glenn. He and I had long before amicably gone our separate ways, but I was still excited about Jesus and all I was learning about Him. That summer in Wildwood forced me to step outside of my comfort zone in so many ways. One of the ways was sharing the gospel of Jesus Christ with people we met on the boardwalks of Wildwood. If we saw a person or two sitting on a park bench along the boards, we would approach and ask them if they would be willing to complete a little survey with us. The questions were quite personal, including “If you were to die tonight and God asked you, ‘Why should I let you into my heaven?’ what would you say?” Depending on the person’s responses and our reception, we would ask if they would like to hear how they could answer those questions correctly and then proceed to share the Gospel using a small pamphlet titled The Four Spiritual Laws. It wasn’t magical; it was just a succinct, logical, illustration-filled way of sharing the truths of our faith—and we were blessed to pray with a number of people on the beaches that summer. If you were to describe your life in one word what word would you choose? What would you say are the 3 things you most desire for your life? What obstacles could hold you back from reaching those things? If you were to describe God in a phrase or a sentence what would your description be? How might God affect your efforts to reach those things you desire most? If you were to die tonight, and God asked you, “Why should I let you into heaven?” what would you say? If someone could tell you how you could be sure you were going to heaven, would you be interested? We both returned to Wildwood the following summer and continued our long-distance relationship when we reluctantly parted August 19. On December 19 that year, Bill proposed a “hello forever” day—asking me to marry him. We married for forever the following August, and life was grand. We loved Jesus, we loved each other, and we were loving our life together. Just over two years after we married, however, that “hello forever” was silenced. Bill died suddenly of complications from surgery for a stomach ulcer (which today would have been treated with an antibiotic). I was suddenly without Bill—but I was not alone. That God that excited me in the early days was still the love of my life and the keeper of my soul. He was my comforter. I missed Bill terribly and felt as if my heart and all my plans had been ripped away, but those days of widowhood brought with them the solace that only time with God can bring. When God brought Steve, a widower with four children, into my life three years later, it seemed a marriage orchestrated and ordained by God. But it was far from easy. I not only married a man, I married his children, ages 9, 8, 5, and 3. I always say I got children the hard way—somehow carrying a child for nine months, going through the birthing process and infant and toddler years is infinitely easier than become part of an established family of children who miss their “real” mother. (God and Steve blessed me with one biological son, so I can note the comparison.) When Steve proposed, he told me he was offering me “an excellent opportunity for personal growth.” Of course, I thought I was up to the task—just as when I had believed I was good and a “Godly woman” as a teenager. I wasn’t. I entered the relationship—or relationships—blind to the reality of them as well as blind to my own faults and weaknesses. I tell people I would never recommend what I did to anyone else but I would never undo what I did either. On this side of the marriage—nearly 19 years later—I wouldn’t change a thing. I wasn’t equipped or as ready for the task as I thought—but my inadequacies forced me to seek God and keep Him first (which is more difficult to do when surrounded by five children and a husband). But God equipped me and made me effective anyway. He made me lean on Him through the hard times… and there have definitely been hard times! I think the parallel to the testimony I shared in college to what I would share now is humility. I thought as a teen that I was good and worthy. I thought as an adult I was spiritually mature and able to handle whatever life threw at me. In both cases, I had to come to the realization that I am not enough but God is. I am humbled because of new realizations in my life. I used to think I was a deserving person, qualified for the job, able. Now I see more and more how big a part God plays in my Christian life—and, therefore, “my qualifications.” Martin Luther once said, “The whole of the gospel is outside myself.” Indeed—it is! We should not receive credit for our “spirituality.” The Christian life is this: the Holy Spirit beckons us, calling us to Christ, convicting us of our sin; then we rely on God and His Word and the power and direction of the Holy Spirit to lead our lives. “For by grace you have been saved through faith; and that not of yourselves, it is the gift of God; not as a result of works that no one should boast” (Eph. 2:8-9). If the word of our testimony thwarts Satan, then I am determined to add my voice to other Christians who are diligently telling their stories. The young teachers at my school have inspired me—perhaps the result of that might be that you, too, will consider the word of your testimony and how you might thwart Satan by sharing how Jesus Christ has impacted your life? Please add your testimony in a comment below. I would love to know your story too! Sara, You have always been a living testimony and a hero to me! This is a beautiful testimony of God’s goodness in your life. I enjoyed reading how God deepened your trust and faith in Him through understanding your own humility and your desperate need of Him. You’ve been blessed my friend. Thanks for sharing. PS. 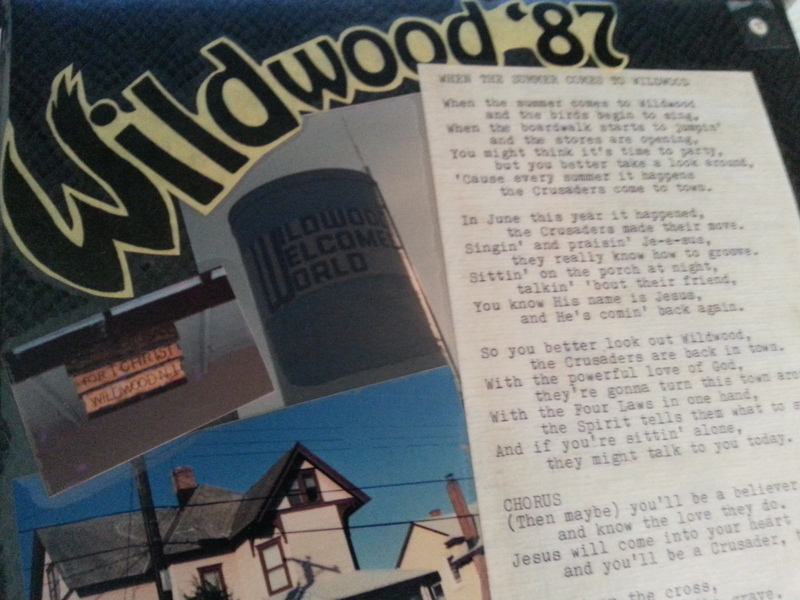 I staffed Wildwood NJ in 1989. Fun times! amazing things in my life that continue to impact me today. God is amazing! I am glad you know him too.